Hopefully you could tell from my decidedly mixed review of Beyond: Two Souls whether or not the game is for you. And if it is for you, a piece of advice: Consider bringing a friend. Beyond can be played from start to finish in 2-player local co-op. I found that I had a much better time playing the game in co-op with my girlfriend than I did when I played it on my own. I'll grant that's at least in part because most things are more fun when she's around, but I also think that something about Beyond's design lends itself well to cooperative play. 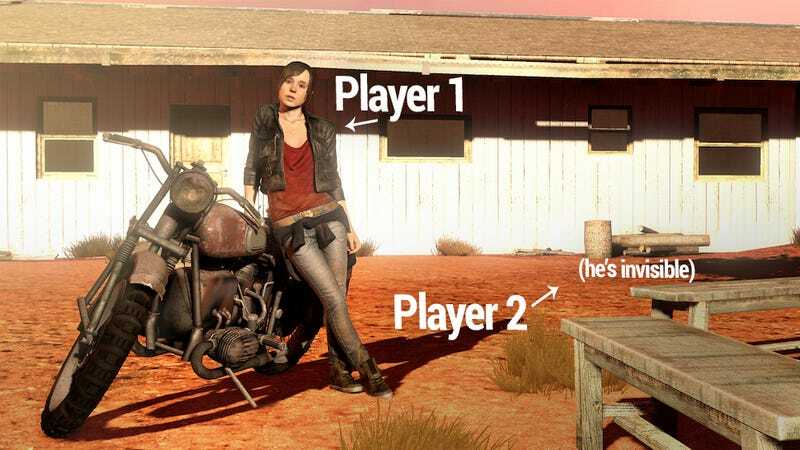 In co-op, one player takes control of Ellen Page's character Jodie while the other player controls her ghostly companion Aiden. Each player can toss control to the other one by pressing their PS3 controller's triangle button. That means that half the time, one of the two players won't have anything to do—they'll have to watch as the other one plays. The game is, as I put it on Tuesday, basically a SYFY original miniseries that occasionally asks for viewer input. It's something you watch at least as much as you play. So really, it's not that big a deal if the Aiden player has to sit around not doing anything for a bit, or the Jodie player has to chill out while Aiden kills dudes. One annoying problem with co-op play is that the thumbstick inversion carries across for both characters. There's no way for Aiden to have an inverted Y-axis while Jodie stays with non-inverted. It's an irritating oversight, and hopefully something Sony will fix in a patch. Fortunately, only Aiden really requires a lot of camera control—in Jodie' scenes, the camera's Y-axis can mostly be left alone. The player controlling Jodie will definitely have more to do, and what they do will generally be more interesting. Jodie gets to make all the choices in the story, and she's the only one who gets to engage in conversations (Aiden isn't much of a talker). Aiden, on the other hand, has more action-oriented gameplay. If one co-op player's video game skills outpace their partner, he or she can opt for Aiden and get a more active experience. It's also kind of nice that the stakes are never too high—it's impossible for Jodie to die, so if the Aiden player does a poor job of saving her in a given sequence, neither player will feel all that punished. The most fun parts of Beyond revolve around little decisions: Lie, or tell the truth? Be helpful, or reluctant? Forgive, or hold a grudge? Drink the beer, or skip it? While only one player gets to make the ultimate decision, debating your options together can be pretty enjoyable. Also, with separate players controlling both Jodie and Aiden, it feels clearer throughout that Aiden is his own character, and not just some extension of Jodie's psychic abilities. Beyond has its share of dumb plot twists, lazy writing, and goofy scenarios. As it turns out, those are _also _more fun with a friend. As anyone who has watched a cheesy movie with a bunch of friends would agree, it's much more fun to roll your eyes at something if you're not rolling them alone. Of course, if you want to play the game but don't have a readily accessible friend to share it with, it's perfectly okay to tackle it solo. It's kind of cool to play alone and swap between two characters, and it certainly makes the game feel more varied. But if you have the means, consider bringing along a friend. Beyond may not be the end-all, be-all of co-op gaming, but it is a pretty fun game to share.